Belief is very powerful. We can choose to believe whatever we want, at any time, often despite the evidence to the contrary. We often choose to believe in things that are not demonstrable in reality, as if it was a demonstrable truth/reality. Knowing what a word means gives us power to use it properly. We can be masters of a name/words and be “magicians” in reality to create or alter our own lives and the lives of others simply with “word-magic” and the power of consciousness. Knowing what a word means gives us power to use it properly. We can be masters of a name/words, and be “magicians” in reality to affect and alter our own lives and the lives of others simply with the “word-magic” that comes from our power of consciousness. Thinking, rationality, and the use of logic, are not automatically developed at a maximum point. We aren’t automatically very rational beings. Rationality, improving the quality of our thinking, and understanding how to use logic, needs to be developed over time. We also don’t understand how words are properly defined because of our intuitive learning process, where we learn words based in a more intuitive capacity through the words being used to correspond and reflect something in reality. Just be hearing words and what they are used to represent, we intuitively understand the general meaning of the word. But we don’t necessarily understand the definition or the etymology of the true meaning behind the word as it was created to reflect something in reality. Two such words that we have confusion about their true meaning, are belief and truth. Belief is not truth, despite how many people erroneously think about and confuse the two. Recognizing the difference is crucial. Most don’t have the accurate understanding of what a belief is, and what a truth actually is, because the way we have learned about those words — through other people using these words and trying to reflect the meaning they were trying to convey — has created confusion in our intuitive/implicit and even explicit definition of these two words. Few people actually understand the root etymological definition of these two words, and how they differentiate. People then talk about things, like verifiable truths, and categorize them as simply being an opinion, as if it were a mere belief. Or people will often say that something is “your truth”, as if to say there is no actual truth about a specific matter or issue being discussed. There are things that are “my truth” or “your truth”, such as one person liking bananas and another person not liking bananas. Those are individual truths about each person’s individual preferences. “I like bananas” is true for me, but not for the “I” of you. The fact that there are bananas, is a truth about something that exists in objective reality, and to deny the fact and truth that there are bananas would make you a fool. We could call bananas anything we want, call it “beepboop”. We could call in that, but that word would be specifically referencing something in reality. The original arbitrary symbol that is created to reference something in reality doesn’t matter, but once you imbue a meaning into a specific symbol — be it a verbal symbol or written symbol — then that meaning is established through that symbol. That is where etymology comes in — the original true meaning of the word as it was created and imbued with meaning. The meaning of the word can of course change through time through conventional use. There are two types of belief: speculative beliefs, and beliefs as “truth”. Speculative belief is a valid form of belief. It’s a belief of what is not currently known to be true or false in reality. It’s possible or probable, or it can be pure imagination. This is the healthy valid kind because we are not in attachment to it, with loyalty, faith or trust in that belief being true. We are not bound to the belief. It does not constrict us into a false perception of reality, as if a belief is truth — which is the second kind of belief, the invalid and unhealthy kind of belief. When we can’t distinguish the difference between belief and truth, then we often automatically associate beliefs as truth. Then we think that things are true, but they aren’t true, they are simply a belief we have. This is the confusion of using the two words belief and truth, and this has existed in our way of speaking for a long time. But if we go look at the etymology and try to understand how these two words differ in their use to describe things, then we can understand how these two words differ in how they were created to reference two different things. This is what I have done, and has uncovered the meaning of these words, and this is what a belief is. 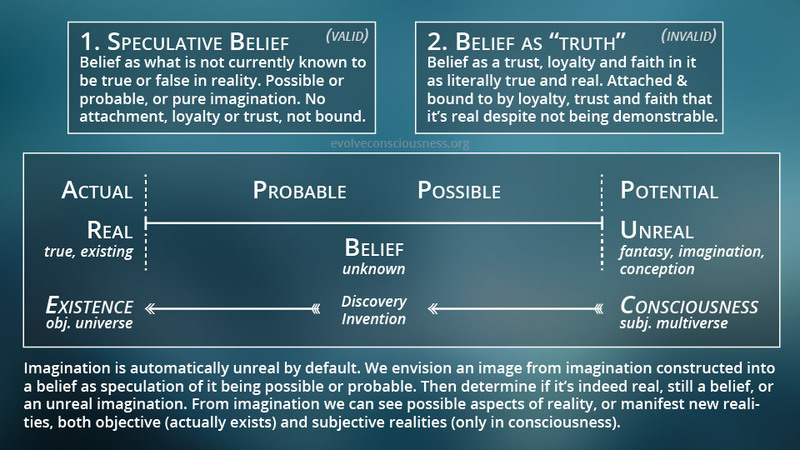 These are the two types of belief that we use to categorize things. One is healthy because it helps us uncover things. The other is unhealthy because it doesn’t help us uncover something, we just think of something or accept what someone else says, and believe that this is an uncovered or revealed “truth” when it isn’t. We accept beliefs as truth, but we haven’t verified it to demonstrated as a truth. A belief as “truth” is when we have trust, loyalty and faith in it being true and real. We are attached and bound to the belief through the loyalty, trust and faith that is real, despite that belief not being demonstrable or verifiable for it to be real and true. In terms of demonstrability and verifiability, there is a difference between what we ourselves can verify and demonstrate and what others can. Truth is repeatable, replicable, demonstrable, verifiable. That is when we can apply the term truth to something. There are things we can demonstrate in our own first-hand experience, and there are things that are secondhand or thirdhand, coming from other people who have certain qualifications and technology in order to validate and demonstrate something as being in reality. They can repeat a process or methodology to demonstrate the repeatable existence and truth of something. Some things can happen and exist in the moment (only for a moment), and then disappear, making them difficult to be easily verified. 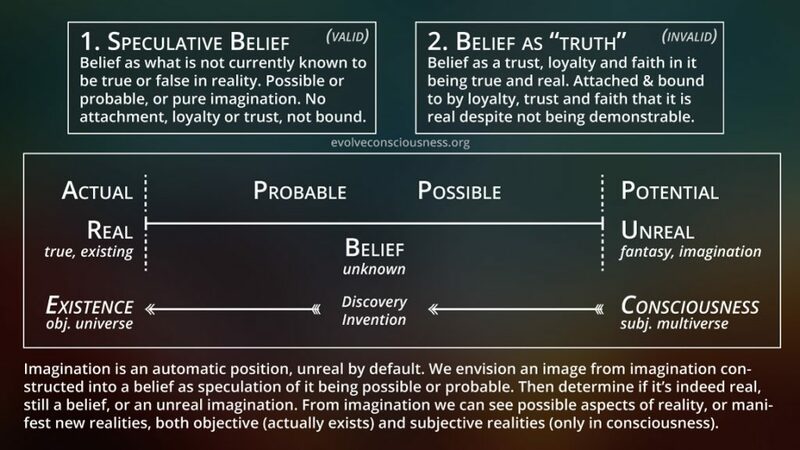 A belief starts off as a potential, something unreal, envisioned from the fantasy of our imagination in consciousness. This is our subjective multi-verse where we can envision many worlds inside of our mind’s eye. This is what happens in a dream where we fabricate an alternate reality, and through lucid dreaming we can take control of this inner existence or reality that we create through the fantasy of our imagination. We can also do this with ideas and beliefs. From that potential, the unreal, we can observe and gather more information from reality to make it into a possibility, and even a probability that it exists and is real. Beliefs are the unknown, the discovery and invention domain coming from our imagination. We can imagine and fantasize about anything. Even in reality when we are trying to discover principles, laws, how something works, or invent something new (technology), this is where it happens in the subjective multi-verse of our consciousness, the imagination factory powered by the engine of consciousness, where we can discover and invent things that can potentially be reflected or created into reality. But this does not mean that whatever we imagine or believe automatically exists or can exist in reality. Belief is not a de facto synonym or representation of what is in reality. Having a belief is simply having a belief. Knowledge can be true or false — it’s only a body of information. Beliefs are by default information, not necessarily true. But if you have knowledge and it is demonstrable, then you have truth: it’s not simply belief or someone’s opinion. This is what a subjectivist in the postmodern world we live in thinks, where people easily dismiss things as simply being an opinion; that everyone has an equally valid viewpoint; that anything someone says is just as valid as what someone else says because “everything is just an opinion, just a belief”. So you can’t say anything is true, it’s simply “my opinion”. But we can know things, and we can demonstrate things. There is an actual objective reality, which subjectivism, postmodernism, solipsism and moral relativism dismiss or can’t accept. A lot of people don’t know how to think, they don’t learn about logic and improving their reasoning and rational thinking skills. In a belief, from the unknown potential, to the possible and probable, we can eventually reach an understanding of what is actual, real, true and existing. This is what is in existence, the objective universe, not simply our subjective multi-verse in consciousness, and the fantasy imagination of what is unreal and potential. There is a process of discovery, and eventually we can verify and demonstrate if something that is possible or probable to create into existence can be, or if something actually does exist. Imagination is automatically unreal by default. We envision an image from imagination, constructed into a belief as speculation of it being possible or probable. Then we can determine if it’s indeed real, still a belief, or an unreal imagination. From our imagination, we can see possible aspects of reality, or manifest new realities — both objective (that actually exists) and subjective realities (that are only in consciousness): external objective existence vs. internal subjective existence. Before a fork was ever created by anyone at any time, first a fork had to be created in consciousness, in our imagination, because it did not exist in reality. We took that possibility, and increased the probability by shaping would for example, before we got to manipulating metal which required mining some ore first. Whittling down something from wood and constructing it into a fork. The point is that first we have to imagine it, then we can actually create it. This is the power of consciousness we have as consciousnesses, as generators, manifestors, affectors, alterers or creators from consciousness into existence. Truth is synonymous with the words reality or existence. The Latin veritas, is the root of words like veracity, veracious, veritable, verifiable, verify. The Latin word veritas means truth. Truth is veracious, it has veracity, it is verifiable in reality. If it can’t be demonstrated, if it’s not replicable, if it’s not repeatable, if it can’t be shown, then why would anyone accept something to be referred to as a truth? That is the whole point of the word truth and why the word truth was created, was to convey that meaning through the word truth. We can understand what the word truth actually means and is, contrasted to belief. What is actual and real is what is true and existing, in the existence of the objective universe. This is really simple to understand once we try to understand these words. Many people don’t understand the accurate meaning and use of these words to communicate about things, because they don’t look into the real meaning of words. They aren’t very interested in philosophy, they aren’t interested in looking into things deeper, they aren’t interested in looking into hard truths about reality that are uncomfortable to look into. This understanding did not automatically come to me. I was already into learning various things about the world and the reality we live in for seven to eight years, and then I was finally getting into language, symbols and etymology. Looking into etymology expanded my understanding of words, language and symbolism, and how they work, what their purpose is, and I began to understand so much more, especially getting into the trivium methodology, of which words and symbols are the grammar part of the trivium method. The words that we use are crucial to understand the reality we are trying to convey and communicate about. This text and presentation is only one demonstration about two words and how important they are in understanding things. Beliefs are generated from the phantasmal imaginal realm in consciousness. Beliefs can be true, but they need to be proven true in order to be referred to as true. Otherwise, they are simply possibilities, and are relegated to the category of fantasy and speculation, at least for the time being, and can’t automatically be associated with the word truth. When we associate a belief as truth then it’s an unhealthy form of belief. Belief must be categorized and understood as speculative until it has been demonstrated. There is nothing wrong with this kind of belief as speculation, this is a valid categorization for imagined ideas. Something that you believe, and idea, can be true, but until it is demonstrated, then you can’t make the claim that it is true, even if it is true you, don’t know it’s true because you can’t demonstrate that it is true. Until it is demonstrated, you can’t make the claim that it is true and use the word true. That is what the word true and truth is for, to demonstrate actual, true and existing things in the existing objective universe that can be demonstrated. Until something is verifiable in reality, that it is veracious and is there, then it isn’t there because you can’t verify and demonstrate it being there. You can’t use the word to reference or categorize it in such a way. True things can happen and can have happened, but unless it can be demonstrated, then anyone could claim something to have happened yet it never actually did happen, and we would simply be calling anything that is false a “truth” when it isn’t. This is why certain words are created to reference one thing and not another. We can’t just reference whatever we want with whatever symbol we want, anytime we want, because then any word could mean anything we want and no one would know what we are referring to. This is why we need to have definitions, because it de-finites the almost infinite array of variability, multiplicity and diversity in existence. Belief as a trust, loyalty and faith in something that we become attached to and bound to, is a negative in general. But if we are not bound to it and attached to it, then we can have have a trust, loyalty or faith in pursuing this speculative belief, idea or concept in order to demonstrate it, in order to know if it is true or not. We can know something as a piece of information, but we don’t know it as a truth. It’s just information and we can share that information with someone else, but that doesn’t make the information truth. Truth is the only thing we should be bound to, because reality/existence is the boundary within which we exist, and reality/existence is truth, truth is reality is existence (they are synonyms). Our desire to believe in whatever we want puts our desires, wants and wishes for what we want to be true above what is actually true. We can have trust, faith and loyalty in a person, that is demonstrated by their actions that garner such trust, faith and loyalty from us. Then we can believe in them, have faith in them, a champion for them, fight with and for them and stand by their side. This needs to be garnered through interaction with them to know them by their actions. It’s not wise to have complete trust, faith and loyalty in someone unless we get to know them first for them to demonstrate a worthiness, a trustworthiness, that they are worthy of our trust, faith and loyalty in them. The demonstrable truth of their actions and behaviors is what we use in our application of trust, faith and loyalty that we apply to them, that others won’t harm us, because they have demonstrated a certain capacity or level of consciousness to us so far. Some people garner more trust, loyalty and faith from us, and some people garner less trust, loyalty and faith. Having faith, trust and loyalty to an idea or belief, does not constitute it as a truth in existence. We can be betrayed by misplacing trust, loyalty, faith or belief in someone. It has to be demonstrable, repeatable and verifiable for us to place our trust, loyalty and faith in them, but people can always break our trust, loyalty and faith in them. The trust, loyalty and faith we have in others is applied in degrees, based in who they are and their expressions of consciousness that has garnered a certain level of trust, loyalty or faith from us. But this can be broken, just like we can have trust, loyalty and faith in a belief as a speculation that can be broken when our beliefs are demonstrated to be wrong. We then break the trust, loyalty and faith in pursuing a speculative belief, because why would we continue to pursue something that is wrong. This is why we shouldn’t accept beliefs as correct, right or true, when they haven’t been demonstrated to be correct, right or true. We need to keep beliefs as speculative potentials or possibilities. If it went from a state of potential, and then when we were able to verify it more and it failed and was demonstrated to be wrong, then it’s incorrect, wrong and false. Maybe we can modify a hypothesis, idea or belief to potentially demonstrate or prove it to be accurate, right and true. But if we can’t prove it, then it’s not likely true or at least it isn’t demonstratably true yet. We can develop theories, such as in theoretical physics, and eventually down the line, decades later, we can develop technology that can verify and prove the existence of a theory. A sound and rational theory can be pursued, but if something is irrational then we should realize that it should not be pursued, to not waste time. Bertrand Russell had a theory, a paradox, and tried to resolve it for years, but eventually gave up upon finally realizing it was a waste of time. He was attached to an idea, a belief, and badly wanted to make it true. Ideas, concepts and beliefs can captivate us because of the trust, loyalty and faith that we place into them. Beliefs are very powerful. We can get very attached to beliefs cause we don’t want them to be wrong. This is one of the large problems in the world. We just want to believe whatever we want to believe, especially with postmodernism, subjectivism and solipsism pervading. We don’t have an accurate understanding of the difference between truth and falsity, and the difference between truth and belief. There is so much confusion pervading, that we are just believing whatever we want to believe because we think in postmodernist, subjectivist and solipsistic ways that we can simply believe whatever we want and it’s just as valid as anyone else believing whatever they want, and everything simply becomes belief and opinion and there is no more truth. This is how confused and lost much of the population is, unable to think properly. I refer to belief as part of a trinity of problems, where belief is a level II problem, and as a result of believing whatever we want where we place pleasure and self gratification above truth and morality, the pleasure trap is the level III problem, and all of this comes from the level I problem which is consciousness and a lack of consciousness, a lack of being with-knowledge, a lack of self-knowledge, a lack of thinking ability. Consciousness is a double edged sword with the capacity to create great evil or great good. This is the power of consciousness we have to create into reality, which has been demonstrated in much of human history to see the good and evil that we have created. That all comes from us, not somewhere else or “magical” imaginary forces. This is why consciousness is the level one problem, and why a lot of my work is about understanding ourselves better, so that we can understand how we function as a psychological and biological being, how the brain works, how thoughts and emotions work and affect us, and how our own natural-biological and psychological capacites affect us. There is a feedback between the biological and psychological, the bio and psycho. Things can happen in our environment that stimulate our senses, that affect us both biologically and psychologically. We can believe something and it effects us at a physiological and biological level. This is how there is a double way of how our minds can affect our bodies and our bodies can affect our minds and change us: the biological and psychological feedback. The level one problem of consciousness is a consciousness that doesn’t think properly or correctly, or know how to think properly or correctly. Which is why learning, caring for truth and understanding the responsibility to learn and improving our understanding of ourselves and the world, will help us to learn more effectively, better, more optimally. We are creating imaginary beliefs to try to explain things about our reality or about ourselves. We are inventing an answer to a question. The question without an answer will create a gap in our comprehension, in our worldview which effects our self view, and this makes us uncomfortable, insecure, with anxiety and fear. This gap or hole in comprehension is a void, abyss and darkness, so we are motivated psychologically to plug it up and fill that hole, to invent answers, invent beliefs and plug them into our worldview, plugging in beliefs in our attempt to understand the world and automatically associate what we invent or are influenced to accept in our minds as if it is reality or truth, when that is not the case. A belief is not a de facto truth. It’s not only ourselves that can accept or invent beliefs, but we can propagate beliefs to others and infect them with mind viruses of beliefs that they also believe in and accept as truth. And it keeps spreading, unthinkingly, uncritically. The problem is that people want to believe certain things to be true because of how it makes them feel, it makes them feel-good, it gives them meaning and value in their lives, so they choose to believe something as a truth when it isn’t a truth. This is one of the big reasons why we are confused and conflicted, especially in religions, because we keep projecting beliefs as truth. We can develop an accurate understanding of the difference between belief and truth in order to categorize the information they receive, filter it, understand it, incorporate it into ourselves and express it to others through an accurate distinction between belief and truth. We can propagate information accurately in our expressions as something being true because it can be demonstrated in this way, compared to other information that we have categorized and expressed as a belief because we can’t demonstrate it to be true. We can abstract and build upon other information, to abstract more concepts and ideas. Beliefs can be healthy or unhealthy, the distinction is when we mistakingly claim and hold a belief as truth, or hold a belief as a speculative potential or possibility.